As we settle back in to our normal life, the girls are pleased to know that we’re resuming some reviews of products from Chewy.com. We are not paid for our opinions, and we only review things that we feel comfortable about recommending. We are provided with a free sample and asked to write a review, which Pyrrha and Eden are only too happy to help with. This time, we got to sample Purina Pro Plan’s Savor Tender Strips. This is a soft treat that is easily breakable into tiny bits, so even though the strips are big dog-sized (about 4″ to 5″ long), you could break them up into small pieces for training. We don’t feed Purina and haven’t been terribly interested in most of their offerings, to be honest, but I was pleased to see that lamb is the first ingredient in these treats. A bag of the lamb and sweet potato treats currently sells for $5.99 at Chewy.com. They are big fans! I have been using broken-up pieces of these strips to entice Pyrrha while I apply some antibiotic spray to her in the morning (she has an ongoing minor issue), and it certainly helps distract her from any small unpleasantness. Do you have a favorite type of treat that’s currently in rotation at your house? Do share! In exchange for our honest opinion, we were provided with a bag of these treats from Chewy.com. I was not paid for my opinion, and I only feature reviews of products I am comfortable recommending to good friends. 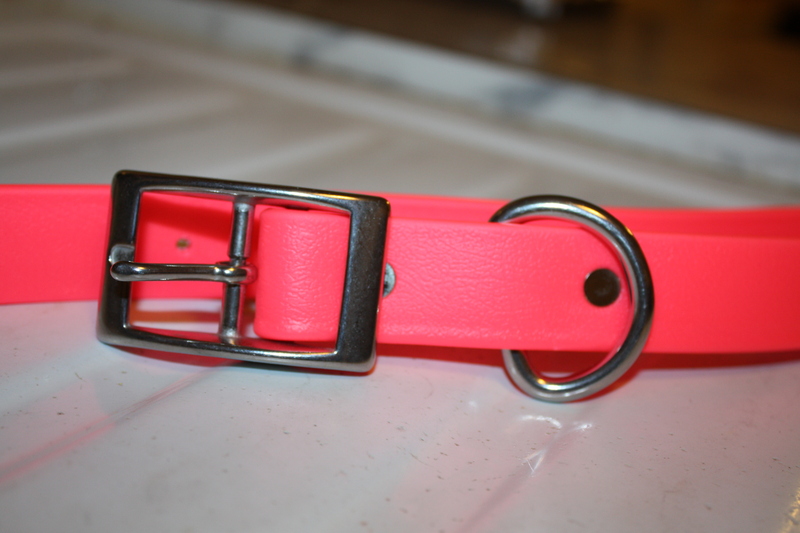 ToughHound ID collar in neon pink. 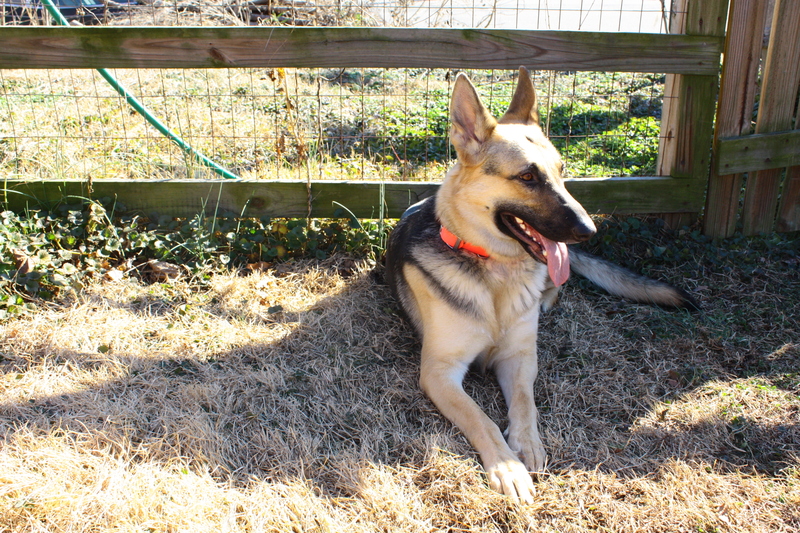 Pyrrha was asked to try out the ToughHound All Sports collar, which retails for $29.95. 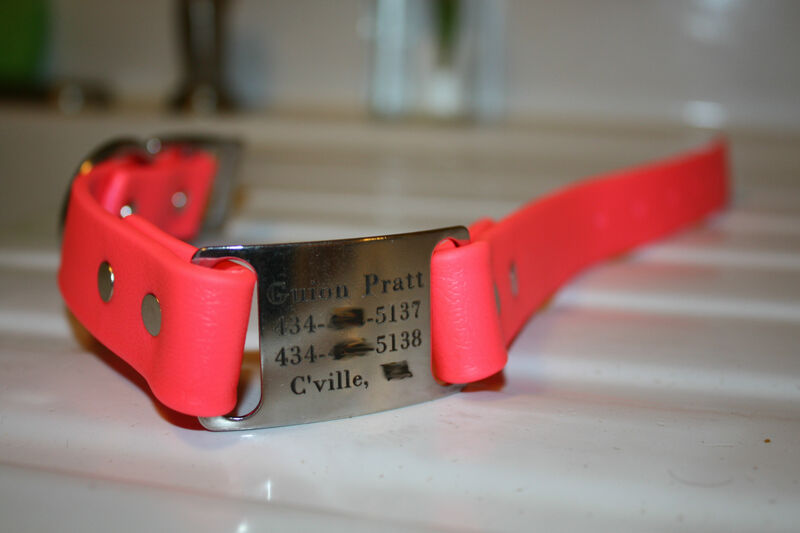 This heavy-duty, nylon/plastic collar comes in a range of bright colors with an attached, stainless steel ID plate (see below). ID tag close-up. (Details blurred.) Font: Bodoni. The ID plate can be customized with four lines of text from a choice of 13 fonts. I liked the wide range of font options (being somewhat of a design snob) and I ended up choosing a bolder, serif font for readability, although there are plenty of “fun” fonts to also choose from. The collar feels very hardy and I imagine it will last a long time. The thick, plastic material also make it very easy to clean. I’d guess that this collar would not get “collar stink” that cotton or nylon-web collars often acquire over time. 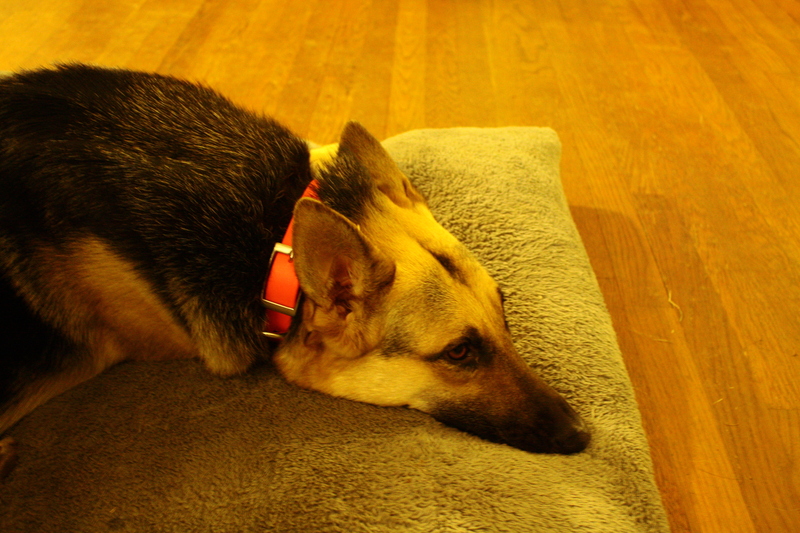 Pyrrha wore the collar for Sunday’s play-date with the boys and it held up to all kinds of wrestling and romping. The collar comes in three widths (she’s modeling the 1″ collar, the largest size) but I do think it is a collar that’s best for big dogs. The plastic material is somewhat heavy and I think it might weigh a smaller dog down a bit. All that said, Pyrrha is enjoying this rough-and-tumble sports collar and it is nice to have that complete reduction in the noise of jingling tags. In short: Pyrrha recommends it. 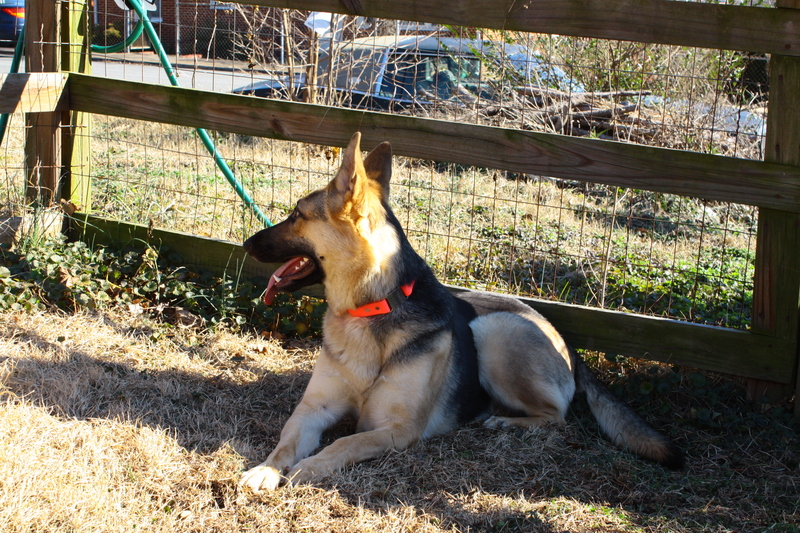 For more information or to order, please visit Dog Bark Collar. DISCLAIMER: I was provided with a collar in exchange for this review, but all opinions are mine. Please also note that Pyrrha and I do not endorse bark collars or shock collars, which this company primarily sells. A meditative mutt. Photo by Winnie Au. AUGH! NO, NO! THIS IS GIN! John Bradshaw’s new book, Dog Sense, is one of the most heavily academic and scientific dog books I’ve read so far–and I loved it. The book came highly recommended by my dog training hero, Patricia McConnell, and so I knew I had to read it at some point. (She also provides a much more thorough and interesting review of the book on her blog.) I was excited when I saw that it was coming in at our local library and quickly put it on hold. Dog Sense is a sizable tome, but it’s well worth wading through all of the research to get to Bradshaw’s arguments. I think a lot of the strength of this book is his strong and profound statements debunking many widely believed myths about dog psychology and behavior. I’ve already quoted his important statement on the popular misapplication of “guilt” onto our dogs. His other significant contribution is his thorough debunking of the old “dominance” model of approaching dog behavior and training. Many other respected dog trainers, like McConnell herself, have written about how this model needs to be rejected, but I don’t think I’ve read a case as strong as Bradshaw’s for why we need to stop talking about and treating our dogs as if they behaved like captive wolves. It’s derived from the way that wolves behave when they are living unnaturally in captivity. Dogs kept in similar captive circumstances do not develop hierarchies of dominance, based around competition and aggression. It was helpful reading such a heavily researched opinion on why the dominance model is outdated and, frankly, wrong. What’s daunting is how many people still believe it. The majority of dog owners, at least in America, talk about their dogs as if the dogs were sneaky tyrants, just waiting for a moment to usurp their human’s power. It’s a sad and limiting way to think about our dogs and I’m grateful for Bradshaw’s fresh perspective on this issue. 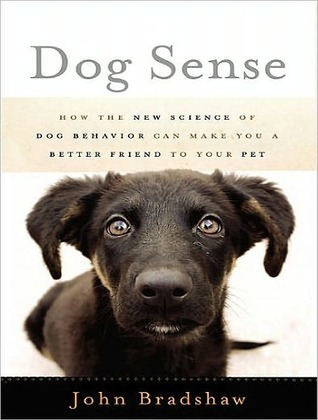 I highly recommend this book to anyone who lives with or around dogs. If you’re not already familiar with the new movements in dog psychology and research, this book will undoubtedly revolutionize the way you consider and communicate with your dog.